But sometimes time simply isn’t on our side and we just can’t immerse ourselves organically in the culture as deeply as we’d like. Such was the situation we found ourselves in while in Xi’an – for the first time since entering China, we were legitimately interested and enthusiastic about exploring some more of the city’s cultural roots, but with a flight booked out bright and early after our second night, we knew we’d be hard pressed to do so in any meaningful way. And then we saw the poster in our hostel’s lobby promoting tickets to a nightly dinner theater spectacle, the Tang Dynasty Show. One of the things we had really wanted to do prior to Beijing sucking the wind from our sails had been to sample some Chinese opera. 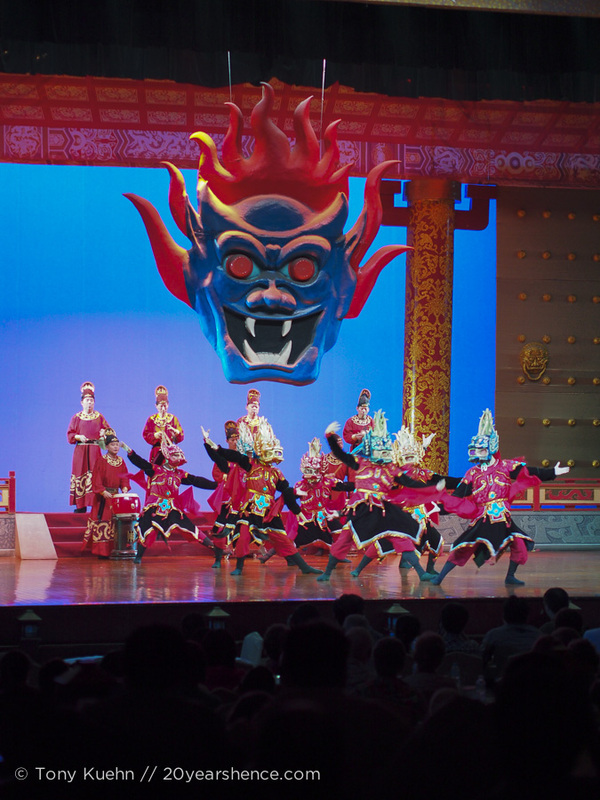 This variety program promised to feature traditional Chinese music and dancing in a bid to familiarize its audience with the Chinese performing arts. Though this type of attraction — a hostel-initiated one at that! — is rarely the kind of thing we go in for as we know it’s targeted mainly at tourists and can only offer at best a superficial glimpse of the culture, we decided to throw caution to the wind and just go for it. It’s certainly true that the show was touristy, but that didn’t detract from our overall enjoyment in any real way. In fact, we wound up being impressed with just how decadent a display we were treated to as the costumes and sets were incredibly elaborate and sumptuous, and clearly the show aims to provide a fun yet classy night out. 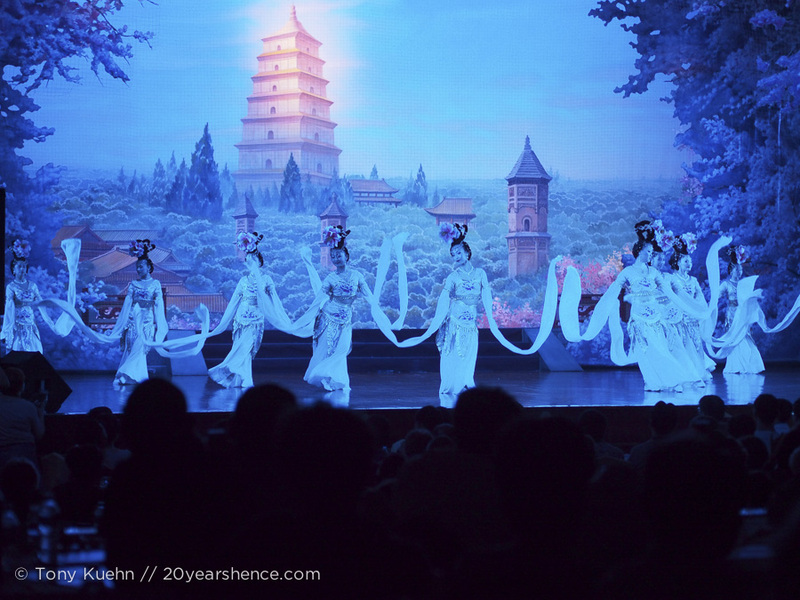 Though certain performances were not to our tastes (for example, most of the dance routines seemed mostly to just be graceful walking and twirling of long flowing sleeves) or potentially were significant in a way we could not fully appreciate (many of the dance routines were apparently based on well-loved Chinese folklore), the skill and showmanship of all the performers was still really enjoyable to behold, as the talent on display was undeniable. How awful about the ladies taking a phone call and not stepping out! But it looks like a beautiful production! rhapsodyinbooks recently posted..January 26, 2013 – Celebrate Australia Day! Thankfully we’ve never experienced the phone call during a movie phenomenon while back home, but it happens A LOT in Asia. Like full blown, full volume conversations… it boggles the mind! Its a good way to spend a night and also we can know about the place we are visiting. The captures show how it must have been. I’m glad you felt like the photos and video transported you to the show! They’re definitely nice keepsakes of the evening. The costumes are gorgeous! Sometimes you really just have to go for something you think you would enjoy rather than worrying about whether it’s the most culturally authentic experience. Jessica recently posted..Is Pattaya Really That Sleazy? Yup, sometimes it’s best to just acknowledge that we are for all intents and purposes tourists and there’s no shame in enjoying activities geared at us. We certainly learned more about Chinese culture that evening than we would have if we had just hung out in our dorm room! Looks like a fun night and a well-deserved change from some the grueling travel experiences you’ve had in China! Yes, it was definitely nice to take a breather and just enjoy ourselves, no fuss no muss!